Holidays to the Maldives guarantee luxurious relaxation. Wake up overlooking crystal-clear waters that come alive with vibrant and exciting wildlife. Whether you love sipping cocktails on the beach or scuba diving off of the coast, you’ll fall in love with the Maldives and want to go back again and again. 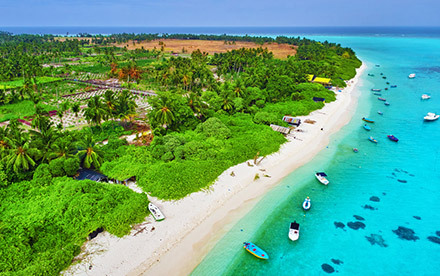 If you’re yearning for paradise, then a holiday to the Maldives is your best bet. Visit a nation where the three pillars of life are seclusion, serenity and simplicity. Bask in unrivalled luxury, have dinner under-the-sea and sleep over the water, go diving in the crystal-clear sea and embrace some much deserved R&R. It goes without saying that much of Maldives holidays are spent on beaches that resemble paradise. With super-soft white sand and crystal-clear warm water, we can see why. You can relax by the calm water in cute pods with a cocktail, enjoy dinner under the stars or take a dip in the warm Indian Ocean – there are so many ways to enjoy the shore here. Each resort sits on its own private island and that a trip to a neighbouring island and you’ll soon realise that this paradise is mirrored across the hundreds of coral islands which makes up this beautiful nation. If you’re having trouble deciding where to go, then consider a multi-centre holiday, where you’ll have the chance to stay in more than one resort while you’re there and experience different islands. If you’ve ever wanted to try your hand at snorkelling or diving then the Maldives is a great place to start. The beaches are surrounded by reefs that are brimming with wonderful tropical wildlife. Snorkel in the luscious lagoons and immerse yourself in your surroundings as exotic fish dance around you. A holiday to the Maldives isn’t complete without discovering some of the best scuba diving spots in the world. Even if you’re a beginner, your resort will usually provide lessons at a supplement. 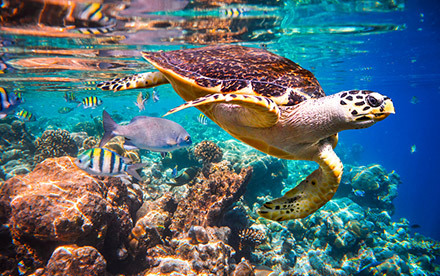 Prepare to be mesmerised by the vibrant coral reef and its inhabitants, swim alongside turtles and be fascinated as the gentle giant whale sharks glide past. Eating on your affordable Maldives holiday is easy as most of the resorts will have their own on-site restaurant, but descend nearly six metres underneath the water and discover the world’s largest all-glass undersea restaurant at Hurawalhi Island Resort. Prepare to be dazzled, not just be the water but by the culinary expertise of the chefs there, which makes this place as much fine-dining as it is an extraordinary design masterpiece. 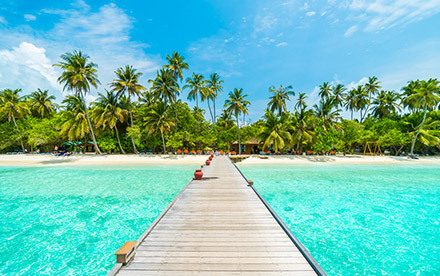 When you book your holiday to the Maldives, you don’t have to worry about when to visit because it’s hot and sunny all year around and averages temperatures typically sit between 23°C and 31°C. The very best time to visit is between November and April, with peak season falling between December and March. Monsoons tend to hit the nation between May and October and peaks around June, so if you want sun for the duration of your holiday then it’s worth paying the higher prices and going during peak season as there isn’t as much to do on a rainy day. 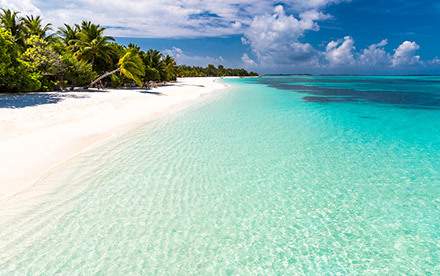 Have a look at our affordable luxury deals to the Maldives and jet off to paradise. This is the perfect destination for couples who want a romantic getaway, honeymooners and it’s even a great destination for families who are looking for a quiet, relaxing holiday!